At Dedham Country Day Camp, we believe that summer time should reinforce the wonders of being a child, and the enduring joy of friendship. While we offer a broad range of activities from archery to woodworking, we also allow time in each day for the simple enjoyment of catching frogs in the stream, climbing trees and building forts in the pine grove. If you have a child between the ages of 3 (must be toilet trained) through entering 7th grade, and you believe that summer is a time to explore, play, laugh, and learn, then DCD Camp is just the place. Our small size allows for each camper to get the individual attention we all want for our children. Come find out for yourself. 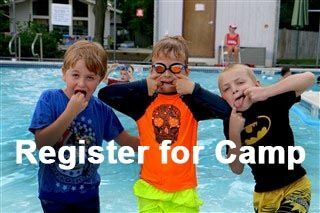 For Campers ages 3 years old - entering Kindergarten old, our Lower Camp is the ideal first summer camp experience. Housed in our Primary School building, the warm home-like environment makes children feel comfortable from the moment they step inside the classroom doors. Our youngest campers enjoy a full program of activities, as well as plenty of time for good-old fashioned play on the playgrounds, in the "pine grove" and in the Primary School classrooms. The Lower Camp building is located adjacent to the swimming pools, making transition to and from swim-time easy. Our Lower Camp Director is an experienced Primary School Specialist. Our traditional day camp program has something for everyone. Camp begins at 9am with "morning round-up" and from there each camp group follows a daily schedule full of engaging activities. Each week, a special theme guides much of the fun. We have had visitors of all kinds ranging from a dog trainer and his trick dogs, to yo-yo entertainers, to scientists from the Museum of Science. However, most of the fun comes directly from the campers who put on Talent Shows, organize camp-wide Olympics, treasure hunts, and crazy contests of all kinds! Make sure to check out the theme calendar and register for the weeks that your camper would love the most. Full Day available to all upper campers. (9am-4pm). Half Day Option available only to campers entering 1st grade. While some camps focus on honing athletic skills in only one sport, our campers enjoy a number of different athletic games and activities throughout each week. DCD Sports Camp introduces campers to a variety of sports including baseball/softball, basketball, soccer, field/floor hockey, flag/touch football, gymnastics, and an assortment of group games. Motor skills, teamwork, and sportsmanship will be taught through skill repetition, drills, and game-like situations in a fun and challenging program. Sports Campers also receive a Swim Lesson each morning. Sports Campers get their extra dose of athletic activities in the morning, and then in the afternoon they join the day campers for Archery, Woodworking, Field Sports, and Free Swim. View Camp in Action Here!